LCHT for MEDICAL APPLICATIONS: Leaders in Hot Isostatic Pressing and Vacuum Heat Treating for the Orthopedic Industry. Partnering with precision medical product providers. and Vacuum Heat Treating for the Aerospace Industry. Working with the biggest names in the Aerospace Industry. 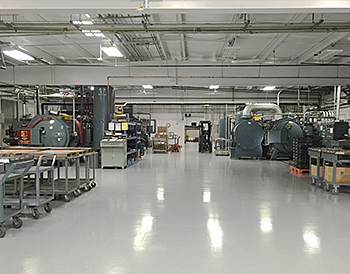 Lake City Heat Treating specializes in Vacuum Heat Treating, Cryogenic, and Tempering services of Stainless Steels, Cobalt and Nickel Alloys, and Vacuum Heat Treatable Steels. Lake City Heat Treating also specializes in Hot Isostatic Pressing. Click here to view our quality certificates. We are approved suppliers of Hot Isostatic Pressing (HIP) and Vacuum Heat Treating services for the aerospace products industry including companies such as Honeywell, Parker, Lockheed and Rolls-Royce/Allison. We are certified suppliers of Hot Isostatic Pressing and Vacuum Heat Treating services for the medical products industry including companies such as Johnson & Johnson / DePuy and Zimmer Biomet. Please contact our Quality Manager for additional approvals. Check out our new VFS Model HIQ3836-6 furnace featuring “6 Bar” capabilities, with a variable speed 200HP cooling blower. Achieving temperatures up to 2400°F and a work load size of 24” x 24” x 36”, the capabilities are incredible reaching exact customer spec requirements. LAKE CITY HEAT TREATING CORPORATION provides a wide range of heat treating services to the aerospace and medical products industries. THEREFORE, we pledge to continuously provide our customers with defect‐free services and rapid product turn‐around by using skilled and highly trained personnel, highly maintained state‐of‐the‐art equipment, and effective quality systems. We are 100% committed to providing the highest quality heat treating services believing this to be the minimum consideration each and every customer deserves for their purchasing dollar.